Grab a coffee and join me in K2TOG, our Facebook knitting cafe. I post quick posts here and I hope you will join me by liking and following the Facebook page. And check out my full posts on the blog page. 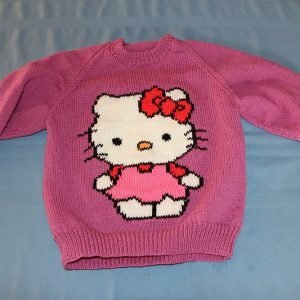 Do you have an FO(finished object) to brag about? Send a picture and I will display it in the K2TOG gallery. We take WIPs and UFOs too. Love to hear from you! Just finished a slightly modified version of Lily Gloves from Donna Druchunas and June Hall's new book: The Art of Lithuanian Knitting. I'll put a longer review on trickswithsticks.ca in the next day or two but, heads up, it's a gem! I had to simplify them a little bit: there is no way that I can get two yarn colours, four needles and my fingers in to knit the glove thumb and fingers but I am still pleased with the result. 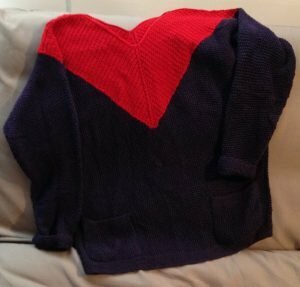 Just finished the Port Orford pullover from Oat Couture. It might be for me and it might not. Oat Couture is at www.oatcouture.com. I liked working with this pattern - it's been in my stash for a while. Used www.knitpicks.com Wool of the Andes in dark greeny blue so it wasn't expensive to do. OatCouture. Where knitting & crocheting are a way of life! It's out! There's a new pattern on trickswithsticks. You can find it here: https://www.trickswithsticks.ca/downloads/old-shale-tee/. Organic DK weight cotton meant to layer over a T shirt or cami. Nice for the Fall weather. I am working on a new pattern. This will be coming soon to www.trickswithsticks.ca, along with tricks for knitting lace. Tricks with Sticks updated their cover photo. One of my favourite places for all things knitting is Purl Soho. Purl Soho is about a delicious colour palette of sophisticated neutrals combined with the brightest colours you've ever seen on this planet. And it works. The company has combined fabric, felt and natural fibers all within the palette so that you can create both wearables and home accessories that all work together. 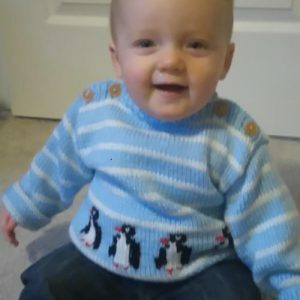 Most of the designs are simple to create and are usually worked with using a single yarn or one yarn in a few colours. The emphasis is on texture and on natural materials: linen, wool, cotton. Everything can be ordered online or you can visit their store...in New York of course at 459 Broome Street in Soho. They ship to Canada in a week at a premium. They run classes and events at the NY store. My next project will be the Purl Soho Pullover, 2017 version. You can subscribe to their newsletter on their site. Note: I am not affiliated to Purl Soho. I just like them. Longing for spring weather. Got an idea for a cotton knit shirt I'm working on. Our newest pattern will be a classic channel island Guernsey. Just have to type and size the pattern. Here's a picture. Tricks with Sticks updated their profile picture.